The Jenkins video always makes me laugh. It’s the short and sad tale of a man who doesn’t have the patience for planning, nor the stamina for statistical analysis. He’s a man who leaps into action without thought of consequence. To Leeroy, there are no 50,000 foot views, no discussions, and … no tomorrow. In the video you can watch as Leeroy’s guild is decimated by dragons who take advantage of the chaos provided by Leeroy’s thoughtless actions. You might be thinking I’m going to liken Leeroy to the developer who writes 200 lines of untested code inside a method named “SubmitOrder” before his team has even left the conference room where they are discussing what the software is supposed to do – but I’m not going to make that analogy. Well, not that exact analogy. 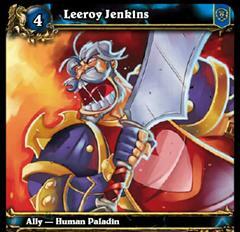 I think there is a time and a place to get some Leeroy into your life. I’m always amazed at email threads where participants debate the possible outcomes of psuedocode when it would easier to just jump in and let the computer decide the outcome. When in doubt – just write the code (preferably with a Leeroyesque shout). Thought experiments are for physicists!